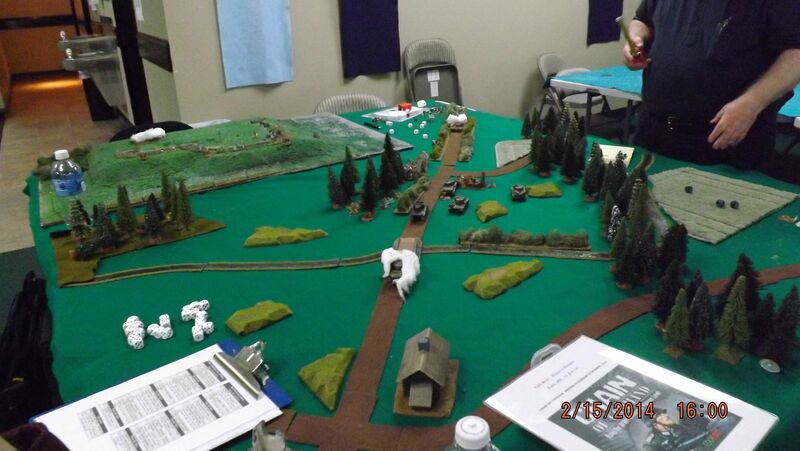 Bruce's Cold Steel was a success, good games presented and lots o' players. And my little bit was a game of Chain of Command, British regulars attacking a German Heer platoon in Belgium in October 1944. OOBs can be seen here. The Germans maneuvered their patrol markers in order to occupy the trench line and the Brits ran forward to in the tree line. 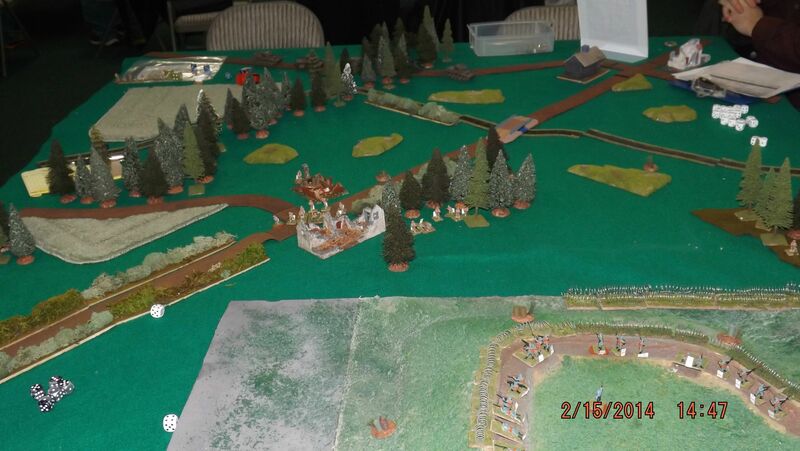 Phase 1 of Turn went to the Heer, who rolled well enough to get a squad and a Pak 40 on the table. 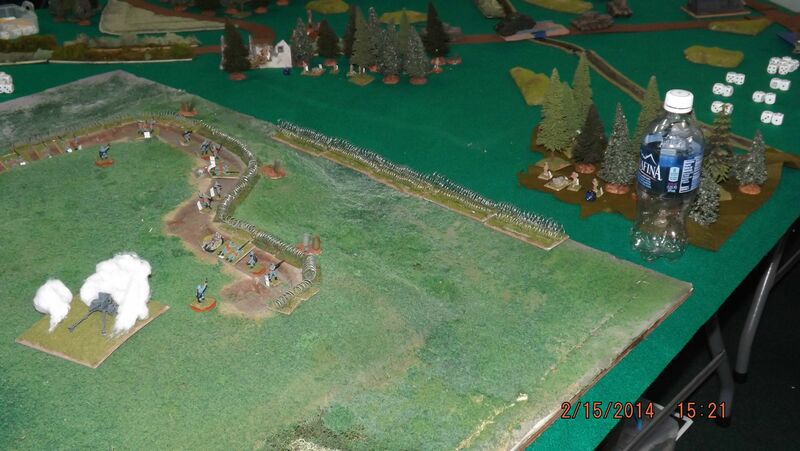 The next 3 Phases of Turn 1 and the first phase of Turn 2 went to the Brits, who rolled 7 sixes in their first 15 command dice. They pushed two squads out, the 1st 2" and a Vickers MMG in their first 4 phases. 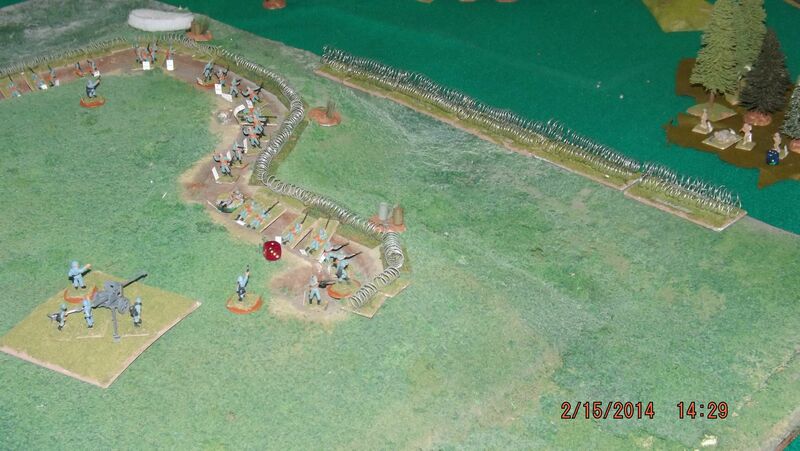 The German senior leaders spent all their points taking shock off the line gruppes to keep them active and able to defend themselves while the Brits kept firing HE at the Pak and not using smoke to deploy their engineers to work on the wire. 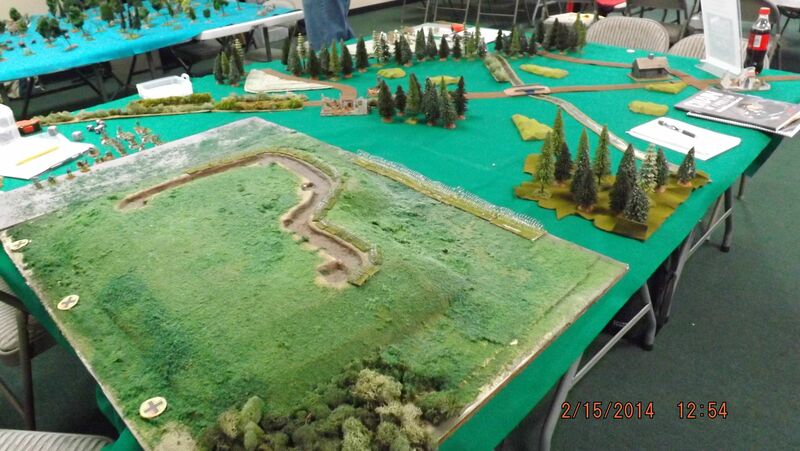 At this point, the Heer FM was 3 and the Tommies at 8. British casualties were 8 killed, the Germans lost 17 (neither total counts tank crews) and it was apparent that the British had the horse power (4 tanks+a PIAT to 2 tanks) and infantry left to push the Heer off the hill and control the area. 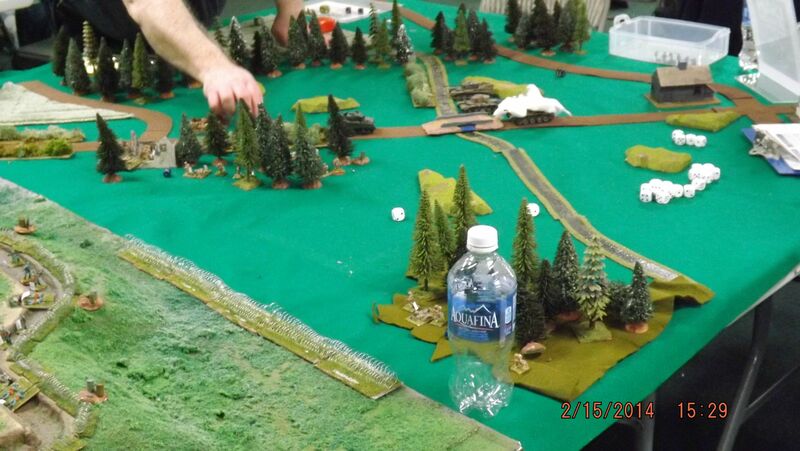 Tom Davis played an excellent game and as usual I played normally (badly) as the Heer while running the game. 5 turns and 48 phases played in 3 hours and 6 minutes, seems reasonable to me as I had to teach the game as we went. My only regret: table too big. 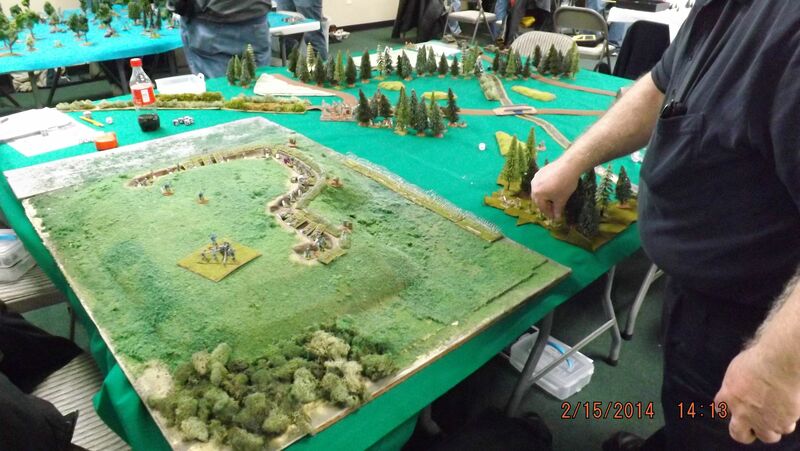 We played on a 6x6 not a 4x6 and I believe that allowed the Brits too much room to maneuver. Great looking game! And you're right, giving the Brits a PIAT obviously overbalanced the scenario. The dice favored the Brits, especially early. They got two sections and a 2" out an in position to continuously hammer away at the trench line. What I should have done is take the SMG squad out of the trench and assaulted the wood line in close combat where their short-range firepower would have made a significant difference. But I was running the game and not playing well.